Garage door “cable offs” are a very common issues that happens to garage doors with a torsion spring system. When your door gets stuck and becomes crooked that usually means one of your cables has come off of the drum. 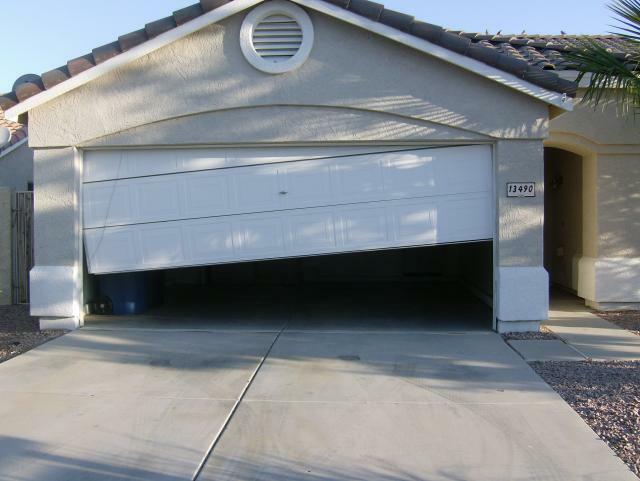 This issue is more times that not caused by the following things; worn or locked up bearings, door opened or closed onto an object inside of garage, previous technician installed the wrong size springs on the door or did not properly wind them to the proper specifications for the door, or the garage has shifted due to foundation issues. A cable off can be a very minor and simple repair that only requires placing the cable back onto the drum or it can cause major damage to the tracks, panels, and hinges. The majority of cable off calls can be repaired onsite with the parts we carry on our trucks. During every inspection we strongly recommend that customers move rakes, shovels, and anything leaning against the wall near the tracks to prevent this from happening. Another common way this happens is homeowners tend to hang things on the horizontal tracks. In either instance when the door is traveling and one side hits an obstruction and the other side does not, it causes the cable on one side or the other to become loose and come out of its designated groove in the drum.